Phoenix landscape design: serving Scottsdale and NW Valley areas too. Great Phoenix landscape design is well planned. Most people look at a beautifully landscaped yard and see sweeps of manicured green lawn accented or framed with a wonderful mixture of colorful and texture rich plants. To the untrained eye, this ambience appears easy to attain. What homeowners don’t understand is that this display of beauty surrounding a home, and its outdoor living spaces, is really just frosting. Professional landscape design needs to do more than skim the surface. The planting is the very last step in a properly planned landscaping installation. It is also hard for the average person to understand that shrubs, trees and other ornamental plants are not just decorative elements. They need optimum conditions to live robustly. For more examples of our landscape design work, Visit Our Portfolio. Outdoor elements perfect for your Arizona home. Xeriscaping seems to be simplified, but there is a good deal of beneath-the-surface planning and preparation that must be done first. A professional design is most definitely an art form requiring talent and skill. Your designer must be able to envision the mature shape and size of each plant placed into the whole, and its relation to everything around it. This is what creates a solid landscape design. Your Scottsdale, AZ, Phoenix or Northwest Valley landscaping’s beauty and functionality depends on this to be low maintenance too for many years to come. The average person forgets that the small plant they purchase will grow much larger as the years go by. Different plants have different needs and must be grouped according to their preferences. Your landscaping is far removed from interior decorating due to the scientific and agricultural knowledge that is a part of every successful design. It is the landscape designer’s job to group plants with similar requirements in a display that is pleasing twelve months a year. Professionals with skill understand that each of the living elements of a landscape must happily cohabitate in that space for many years to come. Unfortunately, this is not the case more often than you would suspect. Professional landscape designers solve problems first. Talented Valley landscape designers have the task of solving site problems along with enriching your lifestyle. Success in putting this all together into one cohesive whole landscape is not as simple as you may assume. Your real estate value will increase with a professionally designed and installed landscape. Your entire yard should be a usable extension of your home. In order to create beauty on the surface, the landscape designer must first correct underlying issues like problems in grade, soil conditions or direction of drainage. Your landscape designer at Desert Crest is highly skilled and experienced in addressing all of the issues found in a Valley landscape. The first priority in landscape design is to identify problems and create solutions. This first step must prove to be technically sound before any beautification can be planned. The second step in your landscape design by a professional is laying out the hardscape elements to be used. 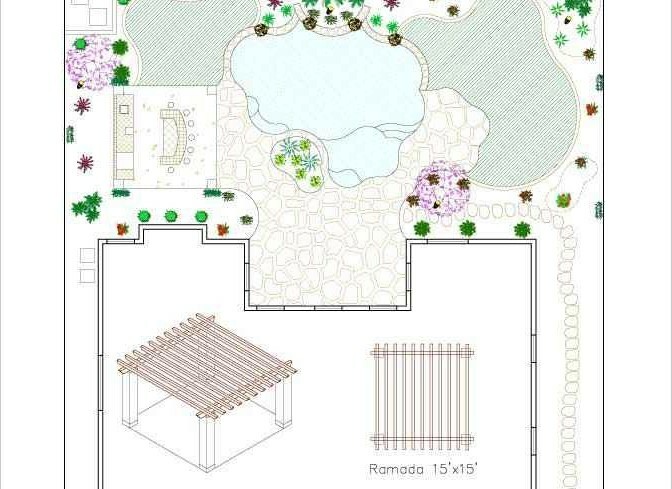 This includes shade structures, fire pits, built in BBQ grills, retaining walls, driveway, sidewalks and paving for your courtyard and patio, along with the skeleton of your irrigation system. Only at this point can the plants envisioned for your yard be considered. To be properly placed, it is of utmost importance to know where and why each plant is placed on the paper. After all your plants are selected and arranged, the designer can finalize the irrigation plan. Proper Arizona landscape design requires great plant knowledge. There is so much that must be learned about ornamental plants and their needs to create great landscaping. The plant kingdom, even in desert landscaping, is vast and widely varied. Improper landscape design will result in many headaches and unnecessary expenses in the future. A landscape represents a significant portion of your real estate value. To reap the most benefit to your lifestyle and a return on the investment into your curb appeal, it is wise to do everything correctly from the very beginning. At Desert Crest, the team is highly skilled in all facets of Arizona landscape design and installation. Discovering the perfect solutions for you, your dreams, your lifestyle and your real estate is easily found here. You and your Desert Crest designer will plan a landscape that will provide enjoyment of both beauty and function. You will enjoy excellent customer service and a one on one experience with your personal designer. You need far more than a landscape contracting company. We build exterior lifestyles and outdoor living rooms that bring your dreams to reality.